It’s festival season in Edinburgh. Depending on who you ask, the summer is either the best or worst time to be in the city. Festival season, I’ve come to learn, also equals tourist mania. This is only my third summer in Scotland, so the tourist thing doesn’t bother me at all. Besides, the city buzzes with an indescribable energy during the summer months. Not even the rain can dampen my spirits. The season brings the Edinburgh film festival, the jazz festival, the magic (!!) festival, and others, and of course the fringe festival, but it also brings the Edinburgh International Fashion Festival (EIFF). EIFF is in its 5th year, but this was my first time attending. I was approached to moderate a panel on ‘ethics in fashion’ and was of course happy to help. This was an EIFF initiative to bring together students from London College of Fashion (LCF) and Heriot-Watt University. The students were to design their ideal panel discussion, and Winnie Wen, a graduate student researching responsible fashion and marketing at Heriot-Watt University organised the panel on ethics in fashion. 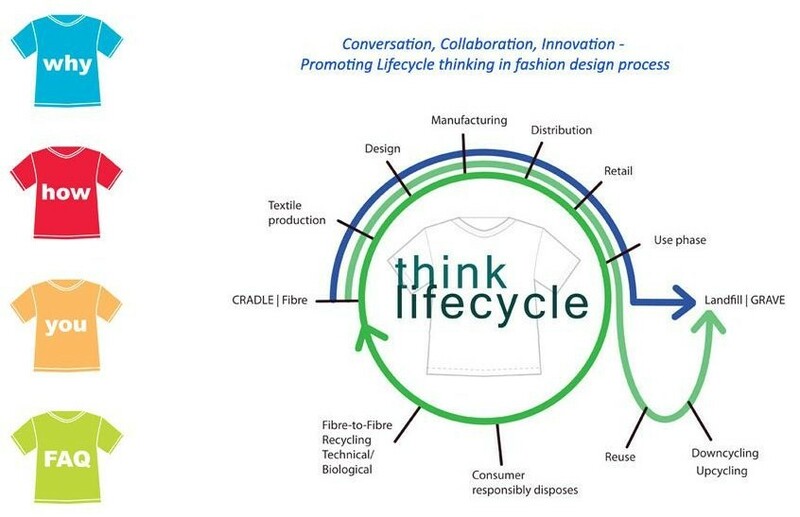 Fashion designers and brands are increasingly challenged to consider the social, cultural and environmental impact of their products; from designing for diversity and supporting labour rights, to protecting waterways and securing animal welfare, ethical considerations in fashion are vast and often interconnected. How can designers and brands engage with their stakeholders to better understand and support complexities at work within systems of fashion production and consumption? Exploring what it means to be ethical in fashion, this panel deals with stakeholder engagement and communication. 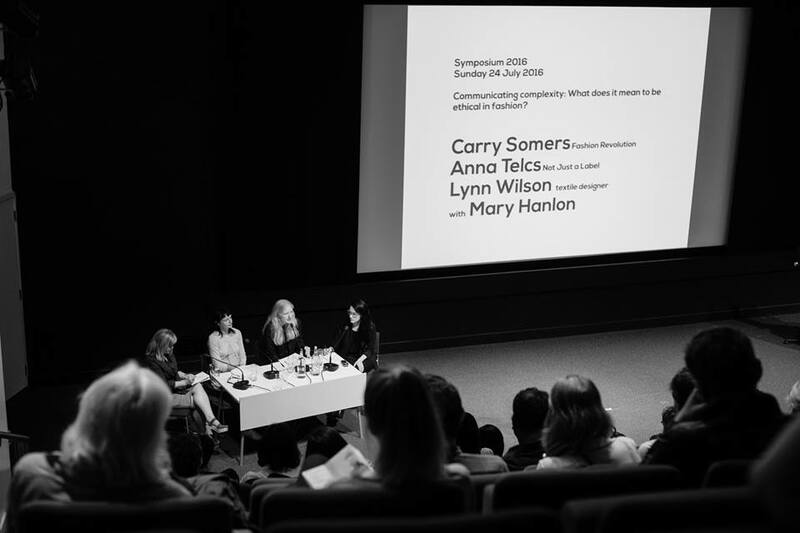 The panel was made up of three excellent speakers: Carry Somers, Founder of Fashion Revolution, Anna Telcs of Not Just a Label (NJAL), and Lynn Wilson, designer, educator and circular economy expert. It was designed to focus on audience Q&A, and the audience was fantastic. The panelists were so very informed, and it felt like the discussion could have gone on for much longer. My favourite question from the audience had to be the last one: ‘What are you all (the panelists) wearing?’ I love this question because it really drives home the mess of responsible fashion work and activism. Is there some perfect outfit to wear that will absolve us of the issues at work in the global fashion and apparel industry? Well, I say no. For me (today, at least) it’s less about individual consumption and more about education, regulations and the rule of law. But for other advocates and activists, it is all about consumption patterns. And for others still it’s a little of both of these positions, or something completely different. And this got me thinking…time for a poll! So just for fun: what are you wearing? You can select more than one option from the non-exhaustive list below! You see I say this now, but every time I go clothes shopping I end up overanalysing absolutely everything until I’ve talked myself out of buying anything at all. Hence the mess that is responsible fashion research and activism…we all still have to get dressed! Nadira and I sure did have fun exploring this tension when we took the Labour Behind the Label Six Items Challenge in 2012. My answer to the question on the day of was boots (Clarks) and trousers (Gap) from the high street, a shirt that was given to me from a friend (I don’t know the brand name), and a second-hand jacket (brand name Aritzia). This entry was posted in Education, Events, Responsibility, Seminar and tagged activism, Advocacy, Circular Economy, Clothing, consumption, Edinburgh, Edinburgh International Fashion Festival, Ethics, fashion, Fashion Revolution, Hariot-Watt University, London College of Fashion, Not Just A Label on August 4, 2016 by Mary Hanlon. On November 10th, the Centre for Sustainable Fashion (CSF), at London College of Fashion, announced the winners of this year’s Fashioning the Future Awards — themed UNIQUE. Congratulations to Ashley Brock (United States), Sara Emilie Terp Hansen (Denmark), Evelyn Lebis (Sweden), Christian Frank Muller (Germany) Alice Payne (Australia), and Lara Torres (Portugal). “Man sinking to the floor” from “An impossible wardrobe for the invisible,” by Lara Torres, is “a video installation showcasing water soluble clothing in order to comment upon the transient and disposable nature of fashion.” (CSF) Click here to view the entire series of performances. Congratulations to all the winners, finalists, organizers and participants! This entry was posted in Competition, Cradle to Cradle, DESIGN, Education, Events, fashion, Fashion Design, Fast Fashion, Lifecycle Analysis, Responsibility, Socially Responsible Design, Student Education and tagged Alice Payne, Ashley Brock, Centre for Sustainable Fashion, Christian Frank Muller, Evelyn Lebis, Fashioning The Future, Lara Torres, London, London College of Fashion, Sara Emilie Terp Hansen on November 23, 2011 by Mary Hanlon. 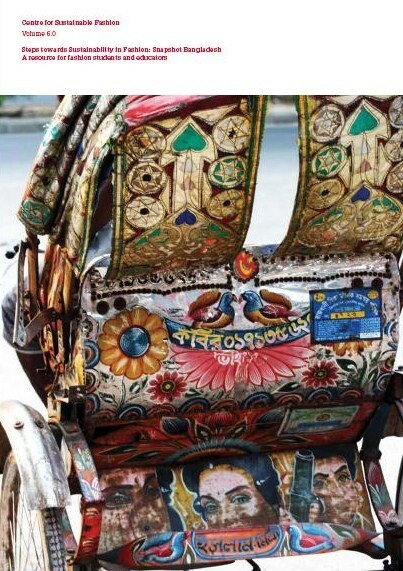 Earlier this year, Fashioning an Ethical Industry (FEI) and London College of Fashion joined forces to produce Steps Towards Sustainability: Snapshot Bangladesh — A resource for fashion students and educators. Citation: Parker, E. (2011) Steps towards Sustainability in Fashion: Snapshot Bangladesh, edited by Hammond, L., Higginson, H. and Williams,D., London College of Fashion and Fashioning an Ethical Industry. This entry was posted in CSR, Cultural, DESIGN, Education, Empowerment, Environment, Environmental, Equal Rights, Fair Trade, fashion, Fashion Design, Fast Fashion, Health and Safety, Human Rights, Labour, London College of Fashion, Political, REPORTS, Social, Social, Social Conditions, Social Responsibility, Student Education, Supply Chain, sustainable, Transparency, Tutor Education and tagged #bangladeshproject, Aranya Crafts, Bangladesh, Echotex, Fashioning an Ethical Insustry, Hammond, Higginson, London College of Fashion, New Look, Parker, People Tree, Williams on July 30, 2011 by Mary Hanlon.